download. 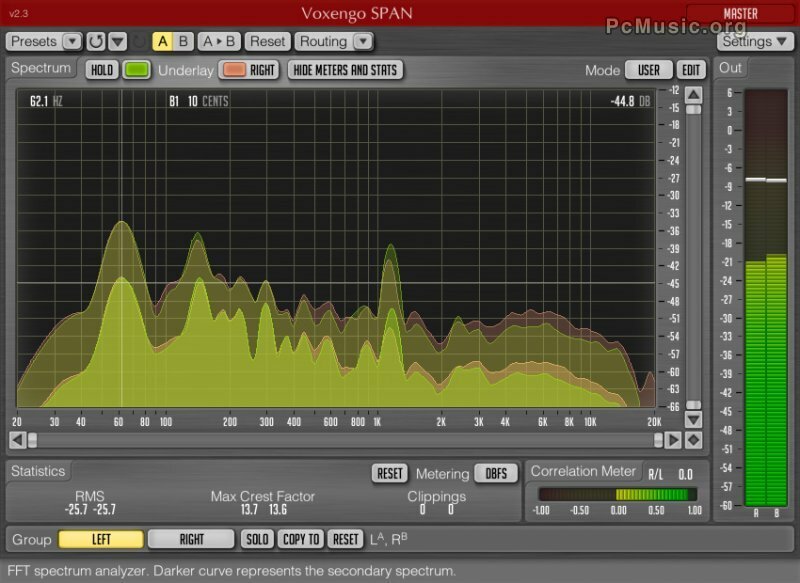 SPAN is a free real-time "fast Fourier transform" audio spectrum analyzer plugin for professional music and audio production applications. For the most part it was derived from Voxengo GlissEQ dynamic parametric equalizer and reproduces its spectrum analysis functionality. SPAN conforms to AudioUnit and VST plugin specifications, and is available for Mac OS X (v.10.4.11 and later) and Windows (32-bit and 64-bit) computers. - Right/left signal power difference readout added. - "Filled Spectrum" spectrum display mode switch added. - Level meter's "density mode" improved. - Control surface crosshair option added (can be switched off in the global options).